There was a time when citizens of Pakistan were accustomed to seeing Trams running all over the Karachi City center. It was one of the most popular means of conveyance in the city center. Today, only a handful of photos, a few landmarks and memories of Trams remain. If you talk to any body who has seen Karachi up to 1975, they will talk about the tramways in nostalgic terms. 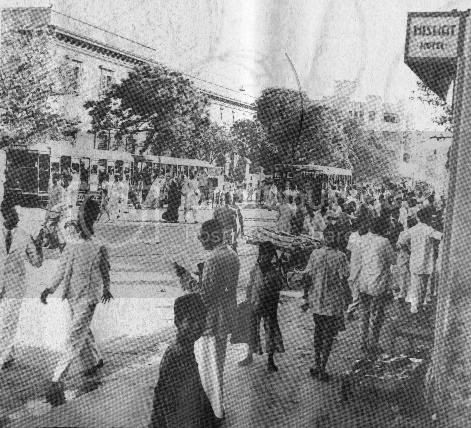 The network was closed down in 1975 after traffic congestion in Saddar area was causing lots of traffic accidents involving Trams as well as older trams were proving difficult to maintain. What happened to the rolling stock and infrastructure is anybody’s guess. I couldn’t find any information on it. Growing up in Karachi however, I remember taking rides in Trams with my father as well as seeing the left over tram tracks which were left to rust in Saddar roads until 1980s. 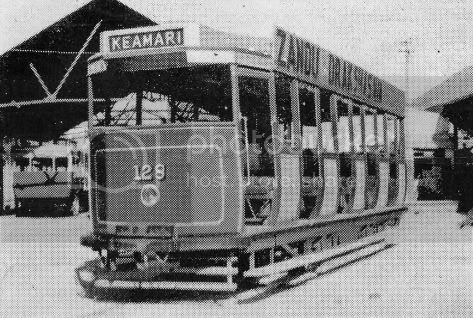 The history of Karachi tramway spans 90 years (1885-1975). It owes it origin to the Municipal Secretary and Engineer, James Strachan who first conceived the idea for a Karachi Tramway. 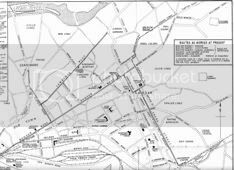 In 1881, Mr. Edward Mathews of London submitted the tender for building this tramway network. It took until 1883 to complete all the formalities and to get Government’s permission to use Steam as the locomotive power for the trams. Actual construction work started in October 1884. Track Gauge of Karachi Tramway was 4 feet. 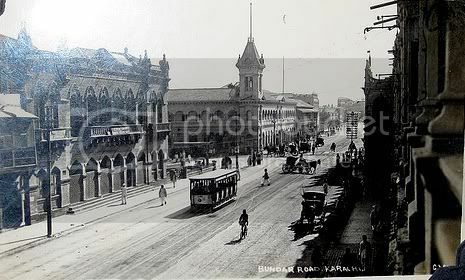 On April 10, 1885 the first tram line in Karachi was opened for public traffic. The track extended from present day Jinnah (then Napier Mole) bridge to Kimari. An imposing ceremony was held on this occasion. The dignitaries who attended the ceremony included Commissioner Sindh, Henry Napier B Erskine, Commanding Officer of Sindh District, Brigadier General G. Luck and his daughter, Assistant Commissioner Dr. J. Pollen and His Highness Prince Shere Ali Khan, ex-Wali of Kandhar, Afghanistan, with his staff. 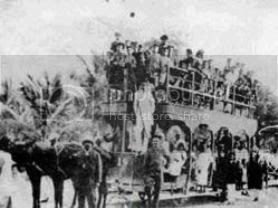 All these people were transported to Kimari and then back to Scotch Church on a convoy of Steam Locomotives and using the tramway track which they were going to inaugurate. The marquees of the project had been erected at the Scotch Church. Refreshments were given to the attendees here and Commissioner Sindh in his speech pointed out that Karachi Tramway was the “first steam tramway in Western India.” He also pointed out that the tramway was going to be used for passenger as well as freight service. The tramway was needed for freight service as Karachi Port was not deep enough in those days. Ships were anchored at present day Kimari area and from there freight was brought to Merewether Pier (Present day Jinnah Bridge/Native Jetty area) by small boats. 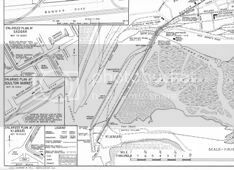 For this purpose some tram rails were laid in the Godowns of Messrs. Ralli Bros. A. McHinh & Co., Volkart Bros., and others, and also along the jetty, so that grain might be transported directly from their warehouses to the boat’s side. 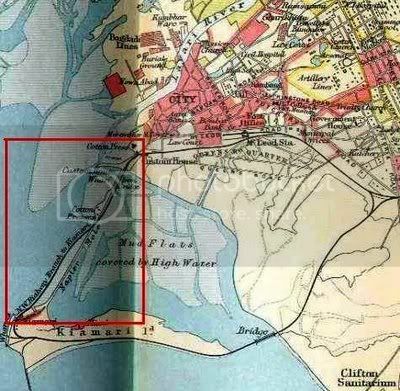 The Map below shows Karachi of 1893. The Red rectangle towards left shows the first tramway track that was inaugurated. Also note how Karachi landscape has changed since then. Kimari is now part of the mainland as sea has receded a lot as well as land reclamation that has happened in the last 100 years. See where ‘bridge’ is written on a railway line towards bottom. This is where present day Boat-Basin is located. In 1886, steam powered trams got replaced by horse drived tramways. This was to the great satisfaction of city residents because the steam engines proved to be too noisy in the residential and commercial areas. The frequency of Steam trams was once every 15 minutes in busy areas and that made the residents quite uneasy because of the noise. After horse trams were introduced, Steam trams were relegated to shunting in depots only whereas light one-horse tram cars took their space on Karachi roads. The photo to the left is an earlier version of horse-driven Karachi tram which used two horses. Horse trams were much cheaper to operate as compared to the steam locomotives fired with coke. The coke had to be shipped from England at a great expense, as Karachi could not afford any supplies, and in Bombay local demands required the whole output of the gas works. 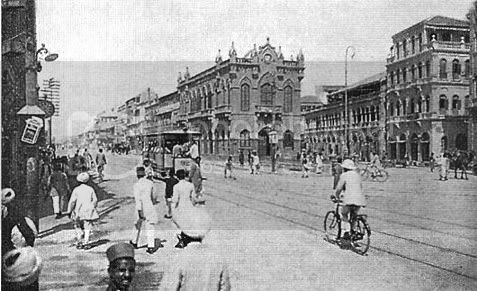 Present day Sindh including the city of Karachi were under Bombay Presidency until 1912. To date, there are some remains of water troughs near Max Denso Hall area as well as in Saddar which were built to feed and provide water to the tram horses. The First Petrol Tram in the World – Karachi 1910. 46 seat —- type. 8 miles per gallon with petrol at 4 annas per gallon. Weight unloaded 3 tons. Designed by John Abbot, Chairman with J.P. Abbot Longfellow. Power unit —– valveless —– and Dixon Abbot patent Gearbox. The company was now titled as ‘The East India Tramways Company’. The chief engineer of the East India Tramway Company was John Brunton, whose name was long known in Karachi in connection with the Karachi-Kotri railway line which was constructed under his supervision. The permanent way materials for the Karachi tram network was supplied by Messrs. Bolling and Lowe of London. 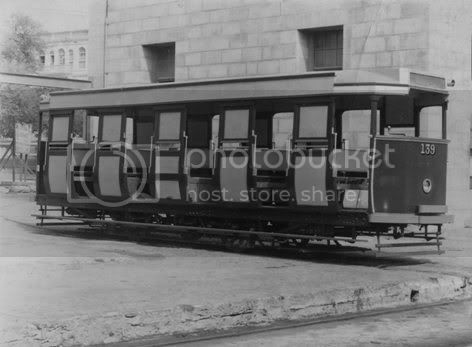 The weight of the rails used in the tramway was 70 lb(32 kg) to the yard. The engines of the tramway were supplied by Messrs. Kitson and Co. of Leeds, the rolling-stock was supplied by the Starbuck Car and Wagon Company, of Birkenhead and the contractors who carried out the construction work were Messrs. Mathews and Crawford. The photo below shows a section of the tram tracks laid on Bundar Road (now called Mohammad Ali Jinnah Road) near Max Denso Hall area. This photo is circa 1900. The career of Karachi tramway for freight business was short lived. Regular Railways took over the frieght business on the route from Napier Mole Bridge (now Jinnah Bridge) to Kimari. In 1949, the whole system of Karachi tramway was shifted from the East India Tramways Company Limited to the Mohamedali Tramways Company (MTC). The tram company was bought by a Karachi resident Mr. Sheikh Mohammad Ali. MTC continued to operate the trams until its final closure in 1975. 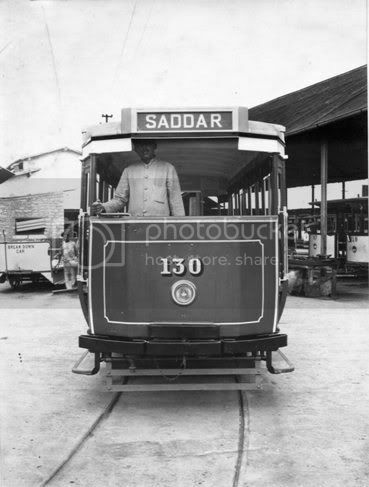 The tramcars of Karachi have rendered yeoman service. But it is time they were removed. It is high time every part of the city was served by a service which we trust will be as clean and as efficient as that of the East India Tramway Co. of Karachi or better still of the BEST of Bombay. Here is a short 50 second video on Karachi Tramway which I made by combining the photos that I have available as well as a short video clip. 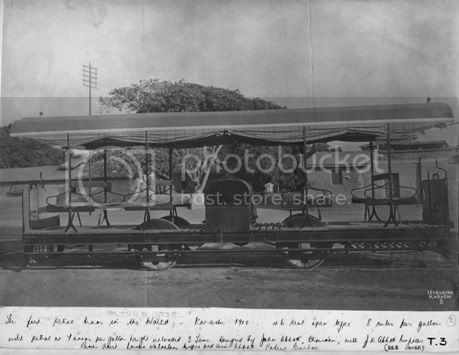 1879: John Brunton devised a special grooved bridge rail of inverted U-shape for four foot gauge horse to be later used in the tramways in Karachi. 1881: Karachi’s Municipal Secretary and Engineer, Mr. James Strachan conceived the idea of Karachi Tramway around this year and Mr Edward Mathews, of London tendered for the construction of the line in 1881. 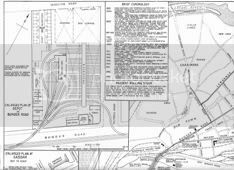 February 8, 1883: Detailed plan for Karachi Tramway is made and settled. Permission is obtained from the Government for the use of steam powered trams in Karachi. October 1884: Work starts on the construction of Karachi Tramway. Gauge of the track was 4 feet. John Brunton, formerly Chief Engineer of the Sind-Punjab and Delhi Railway, and engineer to the city of Oxford Tramways becomes the Chief Engineer of Karachi Tramway Project. 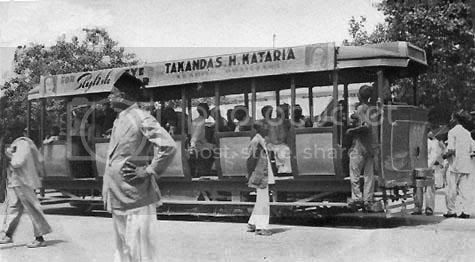 April 20, 1885: Steam Tramway was opened in Karachi. There was a ceremonial opening of the Main Line from Scots Kirk neat St Andrew’s Church (located on present day Abdullah Haroon Road and Shara-e-Liaqat intersection) to Kiamari. Goods line between McLeod Road (now I.I. Chundrigar Road) and Native Jetty were also completed. Steam traction with Kitson Locomotives was used for all traffic. 1886: Steam tramway of Karachi got replaced by horse-drawn tramway for both passenger and goods service. 1891-1900: During this period the Lawrence Road (now called Nishtar Road) route was opened. Also a short extension from Scots Kirk to Empress Market was opened. Exact dates are unknown. 1902: East India Tramway Co (E.I.T.C) Limited which was running trams in Karachi got re-organized with John Abbot as Chairman. circa 1904: Light Steel-framed horse carts were introduced on the tramway. March 23, 1905: Petrol Tram was inaugurated in Karachi. 1907: John Dixon was appointed as an Experimental Engineer on the Tramway. 1909: Horse drawn tramway of Karachi got shut down and was replaced by Petrol driven trams. Petrol trams had a capacity of 46 passengers each and could run up to speeds of 18 mph. Tracks were re laid for petrol driven trams. The First two petrol-engined tramcars were built and tested in England and entered service in Karachi. These cars were the joint design of John Abbott and his son John Dixon Abbott, incorporating the Dixon-Abbott patent gearbox. See photo of this petrol car above under the heading The East India Tramway Company. 1911: Mainline Tracks were doubled. September 30, 1911: Frere Street (now called Dr Daud Pota Road) Route was Opened. February 17, 1916: Soldier Bazaar Route was inaugurated via Mansfield Street (now called Syedna Burhanuddin Road). 1928: Kerbside loading introduced at the Boulton Market. October 22, 1928: Chakiwara Route was opened. 1931: Temporary Extension was made Eastward from Soldier Bazaar, especially for the Indian Nationalist Congress meeting. The Rails were removed after the meeting ended. 1945: First New-Built Diesel cars were introduced. Diesel engines were introduced into some existing cars before 1939. 1949: Transfer of the whole system from the East India Tramways Company Limited to the Mohamedali Tramways Company (MTC). The tram company was bought by a Karachi resident Mr. Sheikh Mohammad Ali. MTC continued to operate the trams until its final closure in 1975. A large number of workers of the Karachi Tramways in Pakistan had gone on strike to protest against what they called “the management’s policy of retrenchment and victimization.” About 700 striking employees were taken into custody. Labour leaders claimed that all but 80 employees had joined the strike. Only a few of the green and white painted trams were running in the capital city. Police lathi charged a large group of 800 employees who were picketing outside the gate of the premises of the Tramway Company. 1955: The number of Petrol Run Trams in Karachi had risen up to 64. These 64 cars were numbered from 94 to 157. These were single deck 4-wheeled back-to-back cross bench cars. and 6 feet 8 inches wide. These cars were built between 1924 and 1948. They were equipped with Perkins P.4 Diesel Engines and Simplex (Dixon-Abbott) Gearboxes. Cars Number 145 to 157 were built as new Diesel Cars; The remained were converted from Petrol cars to Diesel Cars. April 30, 1975: Karachi Tramway got closed down. 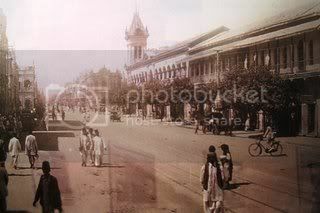 Following two photos are circa 1900 and showa glimpse of Karachi trams. First photo is near Max Denso Hall. Clicking on these photos will take you to their parent website and a larger image. In the following photo the back of a horse driven tram can be seen to the left. 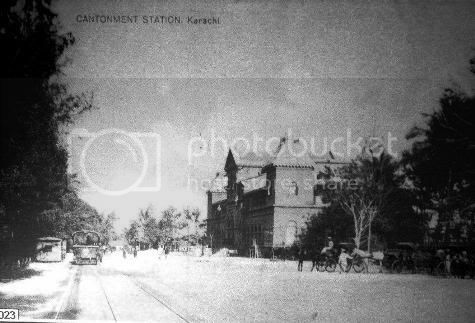 The photo is from outside Karachi Cantonment Railway Station. The following photo is courtesy of Zain Yoonas. 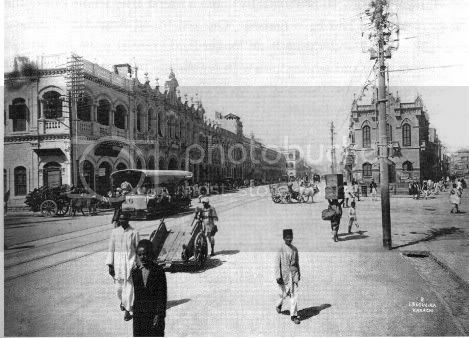 It shows a tram on Bandar Road (now M.A.Jinnah Road) in 1933. Following photo is courtesy of PPL and published by Dawn in their ‘all about Lifestyle’ series. It shows Saddar area circa 1950s and towards left, one can see atleast two trams. The signboard towards top right corner of the photo reads ‘Nishat Hotel’. Any reader who is familiar with Saddar of 50s and this Nishat Hotel locality should enlighten us more about this photo. On 70th anniversary of Karachi Tramway in 1950, following was the route map of this network. Make sure to click on the individual photos below to get their larger and more readable images. 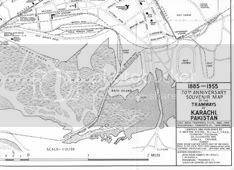 (5) 70th Anniversary Souvenir Map of the Tramways of Karachi, Pakistan. Compiled and published by F. Merton Atkins. Fascinating story about the tonga service on Tannery road. I never knew about it. I only knew about the Victoria service which has been in operation in Karachi since 19th century – though it is on its last gasps now – being confined only to toursits rides near Mr. Jinnah’s mausoleum. The public laundry you mentioned near the end of Tannery road is the famous ‘dhobi ghaat’ of Karachi and it remains a popular tourist spot to this day because of its intricate system of collection and distribution of hundreds of thousands of pieces laundry plus the colorful scenery they create at Liyari river. I have been an international transportation planner and economist since 1961. I have been collecting books, manuscripts, and magazines about all forms of transportation – both urban and rural. Unlike so many “modern” planners, I have included data & information in my library on non-motorized options for urban and rural technology. I point this out, because I have reviewed books and publications of the 1870-1880 period which gave insight into economic use of horse and mule services for urban transportation. Basically, what these items showed was that a company having 90 small trams would require upward s of 700 horses for full daily use. A healthy horse would provide 5-7 years of reasonable service if cared for properly. This meant that a horse could not work more than four hours per day. So if your company was providing 12 hours of service per day, you required three to six horses per revenue tram. Flat areas without severe temperatures could manage with three horses whereas extreme hot or hilly routes would require dual-teams of horses for the same service. Second, before I arrived to the UNDP urban programme for Karachi, I was a consultant for the recently formed US Dept of Transportation, UMTA – Urban Mass Transportation Administration. One of my assignments was to evaluate the emerging “new” technologies now known as APM Automatic People Movers. These were small vehicles that would run on special alignments like a lift, but horizontally rather than vertically. The idea was very interesting. Several USA, German, English & Japanese firms “entered” this field for a few months to several years. The majority of those firms gave up after only two years or less. I was asked to evaluate the APM technology of Boeing Aircraft that was built in Morgantown, West Virginia USA. Although this technology is still in use in 2011, it gave evidence of the challenges with APM methods. Boeing actually withdrew from this project in 1976. The vehicle was supposed to be available WHEN the passenger wanted it. It was to travel directly to the location the passenger wanted – not like a bus with a series of stops along the way. It was supposed to be reliable which it certainly wasn’t. As this technology and others indicated I may NOT have any on-board staff on the vehicle, but I have so MANY control people and maintenance people that the reduced labour costs were lost. I gave a very unfavorable report about the Boeing technology. I arrived to Karachi in Oct 1972. I was charged with preparing a comprehensive investment plan for transportation needs through the year 1995. That seemed a long way off in 1972. I am not one to sit in an office and simply look at reports. One needs to get out – at all hours of the day and night – and actually see how traffic if flowing and being generated, location by location. It might be difficult, but I did volunteer for the assignment. As in any profession DO NOT automatically prejudge was is good and bad. As with life, there is good and bad in anything we do. As I remember I identified 23 methods of transport within Karachi – for both passengers and goods. Some were “ordinary” like lorries, minibus, bus, private auto/saloon, pedestrians, bicycles, etc. But others were special – either to the region or to Karachi. These included camel-carts, tongas, victorias, motorized rickshaw, and non-electric trams. Although much of my young transport staff did NOT want to “lower” themselves to looking at such “inferior” methods – I quickly got them to do it by simply going out with them to count the passengers, bicycles, vendor carts, and tongas. They had never had the experience of having a senior staffer [especially a foreigner] who would go out on the street and do this. Well, one of the locations I quickly found was Tannery Road between the Lea Market and the Lyari River. First this road was two-way, but extremely narrow with built up structure right to the edge of the road. So government would not have an easy time to widen this road. Second, the road ENDED at the River. It did not have a bridge to cross to the north. It would have been hard to build a bridge there because that part of the river was used by thousands of individuals to wash clothes. These were NOT people washing their own clothes, but rather traders whos business was to collect material from families and firms and then wash, iron, and redeliver “fresh” clothing. Even to this day, when I think of the condition of this extremely polluted river, I can’t fathom the clothes being clean. That was one of a thousand things in Karachi that WERE NOT MY PROBLEM. OK. This road of about 2.5 miles was so narrow that two standard buses or Thames lorry could only pass in opposite conditions as speeds of just 3mph or less – frequently their side mirrors would hit into the walls fronting the street. The result was that large motor vehicles tried to stay away from Tannery Rd. This one road had more than 20,000 residents in the area. It was teaming. Local communities I remember were Rangiwara, Chakiwara, Gullistan & Bihar Colony. So what was the local transport? The Karachi Omnibus Service did not provide any services – due to very low speed of the road traffic and narrowness of the road. At the time there were very few minibuses on this route because there were much more lucrative routes on broader roads that they could make more revenue. So what we had was a tonga service that originated and terminated at the two ends of Tannery Road. I have slides of it but I don’t remember exactly where the tongas ended at Lea Market. It was a large open space just to the side of the street. At the north end was another spot like this. At each of these end of the line – the tongas were lined up awaiting their turn for the turn trip. There were normally 60-80 tongas at each terminus. From one end to another the actual tonga trip was 20minutes or less. Now, one of the things I liked about this service was there was NO overloading of the vehicle [compared to bus or minibus] Three normal sized people or four very skinny people could sit on the rear bench and on the front bench. So only 6-8 people could be transported [excluding young children]. It 6-8 were seated, the driver would stand on the step to control the horse. My young staff quickly pointed out the vehicles were TOO small. Why consider it? I asked them to count IN EACH DIRECTION how many tongas passed per 30 minutes or per hour. My insight quickly showed itself. Over an hour period, in both directions the spacing was 12-15 seconds per direction. So each hour per direction the simple tonga was providing 1440 to 1800 spaced for passengers. First, with the narrow street there was NOT any way I could achieve such capacity with big buses – they didn’t fit easily within the street width. So the tongas certainly provided a good service to the public. Also, public bus has “set” halts/stops. They tongas could stop at any location along the route – so the patron did NOT have to walk a long distance to their little pathway into the interior of the urban development. It was a custom service for the local people. No the aspects that really impressed me was that when the driver arrived at either terminus – what did he do? Well, he took the basket of grass & grain from under the seat of his tonga and PLACED it on the back step of the tonga that was in front of his. Then, he walked over to the tea-house/shop and spent 15-20 minutes with his comrades/fellow drivers having a smoke or a tea and conversations. The 50-60 plus tongas in the line would AUTOMATICALLY move forward to the front of the line as the lead tonga departed. It did NOT need any person standing there pushing the horses up to the front. It worked like a charm. Citing my earlier comments about Morgantown, the Tannery Road had better control of vehicles and schedules than the “modern” technology. The next items are the following – it became more important during the end of 1973 when the first major oil price increases took place. These items are the following: 1: Tongas are a vehicle NOT imported, they are 100% made within Pakistan. Even the metal parts qualified for this because they were made mostly out of scrap iron from old lorries and buses. 2: the drivers were available – not from another nation. Also, this was the type of “entry” job suited to many young males immigrating into the Karachi from rural areas of Pakistan. 3: the technology did NOT run on petrol or diesel. It ran on grass and grains – locally obtained within country – no foreign exchange requirement. The driver earned a wage [rather than begging]. He learned more about city life, as he did this job. It provided a service that strengthened the neighborhood. It served the young and the old in a better way. Tongas could be used to divert from the route when fetching children to or from school. They could be used like taxis – if someone was bring home a large box or package like a small frig, stove, TV, etc. Given the low education level of many young males; given the demand for work; given the low capital cost of tonga technology; give that repair was done locally – it was an effective way on back streets to hand major passenger demands. Also, tongas tended to keep powered vehicles at lower speeds due to congestion and nearby activities – this reduced severity of accidents with powered vehicles on these back streets. When I presented this paper to the KDA, it seemed to confuse more of the auto-owning senior staff. They had NEVER received a positive report from a foreigner that tongas were a positive force within the city. We had a lot of discussion about this. They were not happy. Sometime in early 1973 I took one of the junior staff to the field. He and I arranged a “charter” of 15-16 tongas for the coming Sunday. We made one of the tonga drivers the “leader” and told them to come to Preedy Street at 9AM. I sent circulars to city officials, KDA officials, staff, UNDP personnel and others to partake of a FREE tonga trip through the center of Karachi. [At that time Sunday was the day off] I forget the whole route, but I did take them to Cantonment Station, Soldier’s Bazzar, the Clock Tower, Empress Market & other places. It was probably the ONLY time that any of the non-Pakistani had ridden in a tonga. When I find my notes about all this I will update what I have just told you. But you can see after more than 40 years the memories and reasons for this service still remain inside my “transport” brain. I hope you enjoy this. I will keep in touch. A short background. I have worked in transport from 1961 up to 2011. I did urban transport work in Karachi as various time from 1972 until 1995. I have worked in Lahore, Islamabad, Rawalpindi during the 1990s. I was on the time that did the first national transport study for Ghana, and the highway rehab program in Nigeria in 1971-72. I have worked in 15+ nations from Indonesia to Brasil & Bolivia. I helped to build a new technology railway in Jakarta Indonesia in 1988-89 – It is still running. I wrote three publications for UITP of Brussels which reviewed all urban transport in more than 600 cities worldwide. As this short tonga memo indicates, it has been my habit to ALWAYS keep at least ONE copy of my reports and field work – so when, in 20+ years nobody can find it, I still have a copy to show people. If anyone has questions or comments I look forward to them. Thanks. I came across this piece of info quite accidentally but really loved it. Hats off to Mr. Owais Mughal for putting togethor such a rare collection. Being a Karachite and in the railway business in UAE (Dubai Metro) this filled me with pride and provided something to share with my colleagues. @ Mr. Rogers.. Thank you for your informative para. I think it will be wonderful if you could share the tonga report as well.